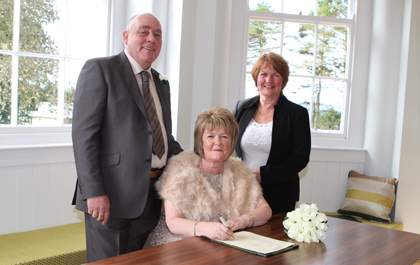 AS Newcastle couple Valerie and Lenny Galloway became the first to be married at the new Downshire Civic Centre, there was a double celebration in the air. The wedding took place on Friday 5 October and the rain even held back to allow the newlyweds an opportunity to gather a few photographs in the picturesque garden adjacent to the Centre. Mr and Mrs Leonard and Valerie Galloway pictured after their wedding at the new Downshire Civic Centre in Downpatrick with Registrar Helen Matthews. Marie Ward, Group Chief BuildingControl Officer who led the development project for the new Civic Centre, said: “We have been passionate about every detail of our new Ceremony Room. For further information about getting married and civil ceremonies at the Downshire Civic Centre, telephone 028 44 610800 and ask for the Registrar’s Office. Congratulations to Mr and Mrs Leonard and Valerie Galloway from Newcastle who were married at the Downshire Civic Centre in Downpatrick.